Monday, November 25: Unit 5 homework is due. Tuesday, November 26: Work-energy theorem lab report is due. On Monday, November 25 a hard copy of your friction lab report is due by the start of class. Please remember to share your Google document with me at alhsgb@gmail.com (not used for email) by this due date. By Tuesday, November 26 at 3:00 please upload your report to TurnItIn.com. The class ID is 6936831, and the password to join the class is Tesla. By Monday, November 25 please take notes on Podcast 14 – Terminal Velocity, Podcast 15 – Kinematics Problem with Newton’s Second Law part 1, Podcast 16 – Kinematics Problem with Newton’s Second Law part 2. By Tuesday, November 26, please take notes on Podcast 17 – Complex Problem, Podcast 18 – Tying Concepts Together. In class we will spend a good amount of time practicing analyzing dynamics and kinematics problems to be ready for assignment 5, which we will do in class, followed by a quiz, as announced. This will take us into the week of December 2 when we will explore Newton’s 3rd law, perform some informal experiments, and complete assignment 6. By the end of the week will will take the unit 3 test. Scientists have uncovered an enormous abandoned ant colony somewhere in the world at some time. The details are sketchy, but the colony is fabulous. (Note that a few ants get swallowed up by cement here, and I’m not saying I’m cool with that.) It’s a pretty amazing testament to the fabulousness of ants. Check it out! If needed we will finish collecting data for our work-energy lab and will then begin our exploration of the conservation of energy. Guided reading 3 is due on Monday in preparation for this. We will develop and solve multiple practice problems before exploring the concept of power to finish the unit. Guided reading 4 will be due as announced to support our efforts. We will spend the latter half of the week doing a one million practice problems. Ideally we’ll be ready for the homework assignment to be due on Friday so that we can take the unit test by the Tuesday before Thanksgiving break. Plan ahead for your studying, since many teachers give a test that day. Tuesday is your quiz over elastic force. For Monday please take notes on Podcast 9 – Inertia and Podcast 10 – Static Equilibrium. As we go over these podcasts, you will design a mini-experiment to demonstrate inertia and static equilibrium. Following this we will complete assignment 4 together in class followed by a quiz the next day. We will then perform a mini-experiment involving the relationship between mass, force, and acceleration allowing us to deduce Newton’s Second Law. As announced, please take notes on the following podcasts, which will not all be assigned at the same time: Podcast 11 – Newton’s Second Law, Podcast 12 – Elevator Problem part 1, Podcast 13 – Elevator Problem part 2, Podcast 14 – Terminal Velocity, Podcast 15 – Kinematics Problem with Newton’s Second Law part 1, Podcast 16 – Kinematics Problem with Newton’s Second Law part 2, Podcast 17 – Complex Problem, Podcast 18 – Tying Concepts Together. It is likely we will finish these after this week, as we will spend a lot of time analyzing and practicing problems related to these podcasts. LAB INFORMATION: Your lab report hard copy for the friction lab is due on Monday, November 25 at the start of class. You must share your Google document with me at my Gmail address, not my school email address. You must then upload your document to TurnItIn.com by 3:00 p.m. on November 26. The class ID is 6936831, and the password to join the class is Tesla. This week’s “Cool Science” feature is about warming. 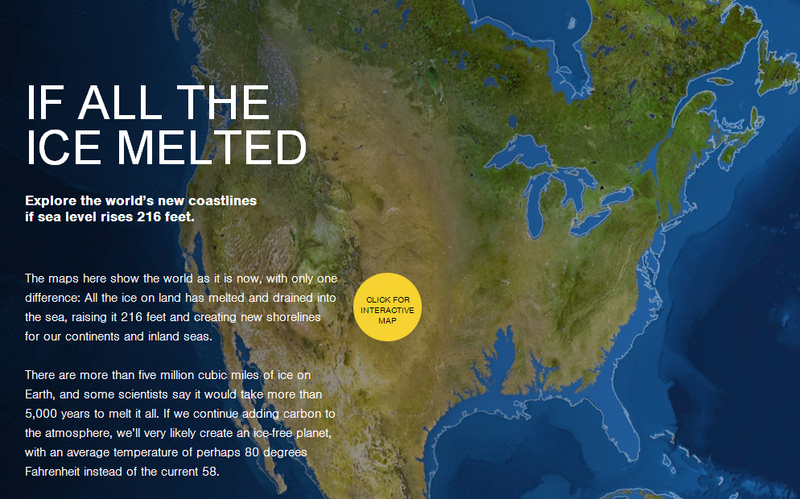 Say goodbye to Florida as you use this interactive map to explore what Earth’s continents might look like if all the ice on the planet melted. Hopefully this isn’t our future! With gratitude, we start this week recognizing Veteran’s Day on Monday. We will continue to move through our energy unit (energy pun intended.) Our focus will be on work and the work-energy theorem. We will conduct a very cool experiment involving this theorem as well as analyze multiple problems. Guided reading 2 is due on Monday. We will complete the friction lab and then explore elastic force in more depth, completing assignment 3 together in class. We will spend a significant portion of the week practicing our lab analysis skills and going over proper lab report writing format extensively. Next we will turn our attention to Newton’s Laws. As announced, please take notes on Podcast 9 – Inertia and Podcast 10 – Static Equilibrium. As we go over these podcasts, you will design a mini-experiment to demonstrate inertia and static equilibrium. Following this we will complete assignment 4 together in class. On Monday we will test the moon unit. To prepare, please study and then do the Unit 3 homework for Monday. Everything you need to know except the lunar geology piece is available on the unit’s podcasts. You are nonetheless also responsible for the lunar geology information as covered in class. Remember also that your unit 2 outdoor lab is due this Monday, as well. That brings us to your next outdoor lab, the unit 3 outdoor lab, which sends you outside to observe the moon. This lab will be due on December 6, which is the the Friday after we return from Thanksgiving break. Start now, as you will need to make outdoor observations many days apart. On Tuesday we will begin our unit on eclipses. This week NASA announced that it’s Kepler Mission, designed to find planets, now estimates that 22% of stars similar to our sun (which is a very typical star) have planets in the “habitable zone” where heat and light conditions could allow life. With around 20 billion Sun-like stars in the Milky Way galaxy, that amounts to billions of potentially Earth-like planets that are in their respective habitable zones! Below is an artist’s illustration of Kepler-62f, a planet in the “habitable zone” of a star that is slightly smaller and cooler than ours. 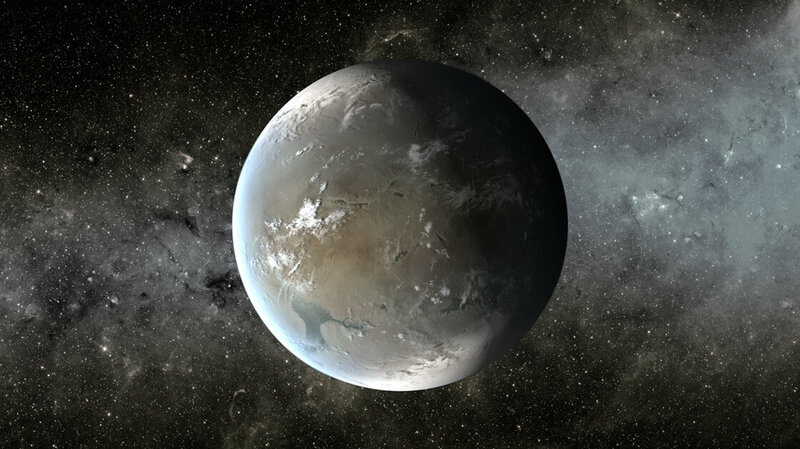 Kepler-62f is roughly 40 percent larger than Earth. We will test on unit 4 (circular and rotational motion) on Monday. The lab report for our circular motion lab is due on Wednesday when we will also begin unit 5, which covers energy. Your first guided reading from this unit will be due on Thursday. We will continue our exploration of forces by going into depth regarding friction. We will do practice problems, conduct an experiment, and do assignment 2 together in class, followed by a quiz. It will be a rough week (ba dum bum!) Depending on our rate of progress, we may get to elastic force by Friday, in which case you should take notes on Podcast 7 – Elastic Force and Podcast 8 – Elastic Force Sample Problems if announced. NOTE: If you are in 3rd period only, you have a quiz on Monday over our first set of learning goals. We will continue to analyze the motion of the moon during a lunar cycle so that we will be able to predict appearance, rise/set/appear/disappear times, and alignment for all moon phases. On Monday we will finish our “puzzle” and go over it. Then we’ll do one final activity to help us seal the deal on this set of learning goals. Your graphic organizer (handed out on Friday) will also be due. We should be ready for a super big quiz over these learning goals on Wednesday or Thursday, when we will also go over lunar geology. We will likely take the test for this unit on Friday. If you are confused, remember that there are two podcasts that cover this material in depth: Podcast 2 – Lunar Phases and their Appearances and Moon Podcast 3 – The Phases and their Timings. The Lunar Phases Interactive website we used in class is also helpful. In astronomy we’ve talked about how the far northern latitudes receive little to no direct sunlight during the months between the autumnal equinox (late September) and the vernal equinox (late March.) Check out what this Norwegian town did to capture some sunlight!